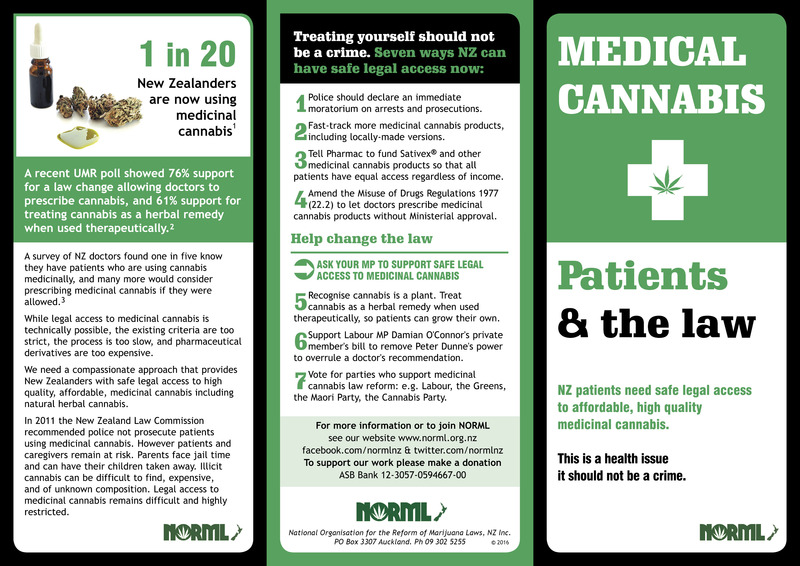 New Zealand patients need safe legal access to affordable, high quality, medicinal cannabis. Good news, after years of lobbying by NORML and others, the Government has passed a law to do this. creates a full scheme for all patients by December 2019. Is the new law good enough? We ask, what would Helen Kelly do? Check out NORML’s 4-point model for patient-focused policy. What do you think? Email your MP here. Police are still prosecuting “Green Fairies” who provide medicinal cannabis. Modern research suggests that cannabis is a valuable aid in the treatment of a wide range of clinical applications. These include pain relief — particularly of neuropathic pain (pain from nerve damage) — nausea, spasticity, glaucoma, and movement disorders. Cannabis is also a powerful appetite stimulant, specifically for patients suffering from HIV, the AIDS wasting syndrome, or dementia. Emerging research suggests that cannabinoids found in cannabis may protect the body against some types of malignant tumors and are neuroprotective. Currently, more than 60 international health organizations support granting patients immediate legal access to medicinal cannabis under a doctor’s supervision. Changes from Sept 2017 mean the non-psychoactive but medically useful cannabinoid, CBD, is now available on prescription with no approval required from the Ministry of Health. The UK-made cannabis extract Sativex has been made available on prescription from your GP, although funding remains an issue and Ministerial approval is still required. The Minister of Health had already approved several applications since October 2008 to import and use the UK-made cannabis extract Sativex. which had followed a petition organised by NORML and the debate surrounding the Green Party’s 2006 medicinal cannabis law reform bill. Health authorities conceded that cannabis does have therapeutic properties and is a valid medicine. In 2011 New Zealand’s medicines regulatory agency Medsafe gazetted Sativex as an approved medicine in New Zealand. This means patients can now go to their regular GP for a prescription, rather than needing an additional specialist. There is still some red tape, but less of it. This is fairly good news for patients. Herbal cannabis still denied to patients but may be available after December 2019. No patient has yet been approved by the New Zealand Government to use real herbal cannabis. 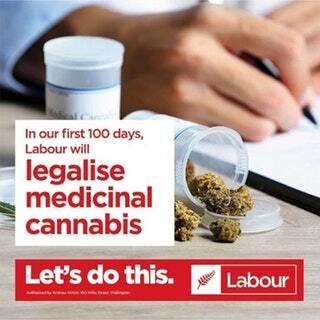 The New Zealand Misuse of Drugs Act 1975 prohibits any use of cannabis, including medicinal use by seriously ill patients, however the Minister of Health has the power under section 14 of the Misuse of Drugs Act and associated regulations to issue licenses permitting medicinal cannabis use. Misuse of Drugs Act regulations allow a patient’s doctor to apply for special permission to import and prescribe a cannabis-based medication that has been approved in another country, or to run an experimental clinical trial (Sativex is one of those, but there are others. Theoretically, it should include the medicinal cannabis found in dispensaries in California and other US states). Your GP must also have the written backing of a relevant specialist, and they must have tried all other available medicines and found that they don’t work. Despite these high hurdles, several applications have been made to various Ministers of Health for patients to be able to consume whole herbal cannabis – which could be imported from authorised suppliers in Canada, the US, Netherlands, Germany or Israel – but so far all applications have been rejected. 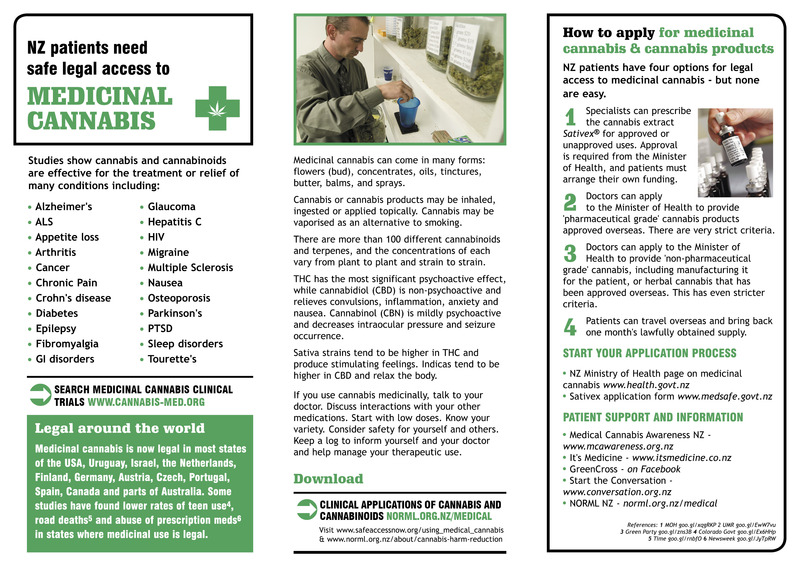 The medicinal use of cannabis is legal in 36 states of the USA including California and Washington DC, the Netherlands, Germany, Spain, Canada and Israel. Research shows allowing medicinal cannabis will not effect overall use rates or teenager’s attitudes towards drug use. One million Californians can legally purchase medical cannabis at dispensaries or they may grow their own. In fact, research shows medicinal cannabis law reform in the USA is associated with reduced teen use rates as well as reduced road deaths.